A couple of summers ago my eighty-something father gave up the wooden sailboat he had designed and built himself. A wooden sailboat takes a lot of upkeep — work that very few people can do even when they aren’t in their eighties — and it had gotten to be too much for him. The wooden hull was pretty damaged, so my father cut it up, putting pieces into the marsh for animals to use. He gave me the forward hatch cover and the wooden strip from the bow that held the registration numbers: I have both pieces in my home office. My father spent last year exploring the river in just a little aluminum motorboat, even designing a seat that would give him back support, but he missed sailing – the peaceful feeling you get when your boat is powered by nothing more than wind hitting canvas. 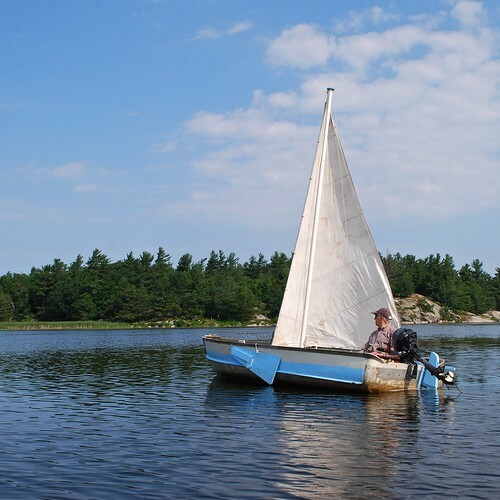 So over the winter, my father turned that little aluminum motorboat into a sailboat. He made a mast from PVC pipe and used wire for the rigging. Since the metal boat has no keel or centerboard, he built wooden leeboards that can be raised and lowered from either side of the boat. He worked the calculations out on paper, then built every piece he needed, painting the new wooden parts blue to indicate the transformation the boat was undergoing. The last thing he did was to take an old cotton that he used on his first sailboat, spread it out on the floor, and cut and sew until he had new sail for his boat. So last week when I was up at camp, we waited for an afternoon with a light wind and I went sailing with my father. Sounds like ingenuity runs in the family! What a great story! He's an inspiration. That's great! I longed for a sailboat when I was about 10. I prayed for it, too, and one day we got a metal canoe that could be fitted out as a sailboat with lee boards and a rudder and a mast that fitted into a metal piece that we left fitted forward of the two seats. One could only sit in the back seat when sailing, and usually it was best to sit in the floor and hike out when needed. I think this needs to be a blog post! That's utterly charming. Is she yar? How excellent! I was thinking of you today, as my sons (11 and 14) enjoyed their first-ever game of Ultimate with friends :) I find myself hoping it turns into a regular thing . . .